Noah Ophis was a gorgon who targeted and consumed 17 men on a spree through the southern U.S. which ended in New Mexico. Noah admitted to one of his victims that he doesn't enjoy eating people, as it is a lonely existence, and there are only so many ways to cook humans, but did so for his survival. At some point, Noah chose to focus on men as his primary source of food, claiming that while he did eat women, they had become too cautious in recent years, making it more difficult to prey on them. Noah was also the owner of a snake, Felix, whom he brought with him everywhere and spoke to while preparing his meals. In Raton, New Mexico, Noah prepares a feast for himself, harvesting the liver from a male victim and frying up breaded liver cutlets among other items. Wishing to have a proper meal without interruption, Noah consumes the eyeball of the victim, allowing him a glimpse into the future where Sam and Dean come barging through the front door. Knowing he has been found once again, he plucks the other eyeball out for a snack, gathers Felix and his clothes, and heads out the door. At a truck stop, Noah preys on a trucker, offering him "anything" to pay him back for a ride and some food. Inside the cab, Noah kisses the trucker on the lips. Dissatisfied and telling Noah he will have to do more than that, the trucker abruptly becomes paralyzed by Noah's poison. Noah apologizes that the numbing effect of his poison will take time and that he will feel it when Noah removes his eyeball and consumes it. After eating the trucker's eyes, Noah leaves a note to Dean warning him and everyone else to stop tracking him or he will make them stop. Noah finds yet another male victim, with whom he makes a deal: if he does not scream, he won't have to die like the other men. When he begins telling the man that he will eat him like the other men he has eaten, the man begins to scream, forcing Noah to place a kiss on his cheek, paralyzing him. As Noah begins his preparations, he is surprised by the arrival of Castiel and Jack. He laments that they are not humans, so he didn't see him coming. Noah begins attacking the two and manages to place a kiss onto Castiel, paralyzing him. When Sam and Dean arrive, they are easily taken care of by Noah, who repeatedly bashes Dean's head into a wall, rendering him unconscious. As Noah is about to leave, Jack appears from a corner and decapitates him. 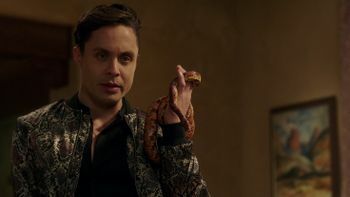 After Noah's death, Jack adopts his pet snake Felix, which he keeps in a plastic container in the Bunker. This page was last edited on 11 March 2019, at 13:21.